The entrepreneurship life of Mr Aliko Dangote, sole owner of Dangote group has the imprint of a mafia marauder, who use people to his advantage and rewards them thereafter. The founding of one of his prized assets, as this medium will uncover later is a testimony to how good he is to keeping to promises but there is a dent in him about Fidelity to other causes. Like Slayqueens live for the gram so do Aliko Dangote live for the camera and applause of society but practices the opposite once the lens is off and the accolade fades away. With his various donations, especially to ravaged Boko Haram states and vehicles to the Nigerian Police, many have been hoodwinked into believing that money spent on such means nothing to him. For the money spent on them, he gets the reward and more gains through free publicity that comes with it. He knows that publicity is priceless and craving for it, he keeps the philanthropy running while basking in the glory that comes with it. In all these, as the Nigerian football team played its friendly and international matches in Asaba Stadium ahead of qualifications for the next African Nation Cup, with the last one being the Egypt National team, SecretReporters can report that his fidelity to fatherland is very much in doubt, as the promise he made since February 2013 during a presidential dinner in Abuja to the Super Eagles, who won the AFCON cup in 2013 is yet to be fulfilled by him. Six years after, Mr Dangote who enjoyed the fanfare and publicity allegedly has not deemed it fit to wire the $1,000,000 he pledged on the spot and has pretended like he never made any of such promises even after getting a reminder by NFF in 2014. When contacted by our reporter the Group Head, Corporate Communications at Dangote Group, Tony Chijiena refused to categorically confirm if the pledge was redeemed as he stated: “We don’t relent on our pledges”. The NFF chairman, Amaju Pinnick who should also know to judge by the amount of money involved, as the Federation records should show extracted himself from direct confirmation when he was also contacted, stating that he was not the NFF President then. “I was not in the NFF then, they won the AFCON in 2013, I was elected in 2014”. 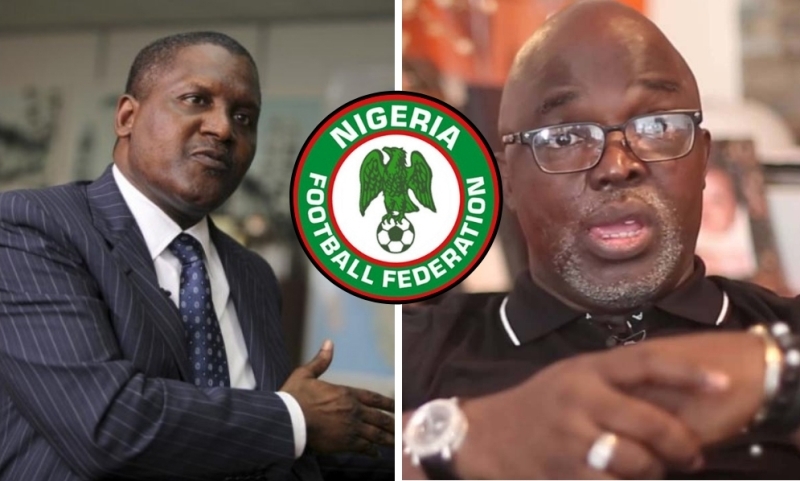 Nigerians called for Dangote’s head by taking to social media when Super Eagles world cup goal-king Musa fulfilled his promise of N1million Naira for every goal scored by the Olympic Eagles against Libya as they allege that the Federal Government-made billionaire has refused to fulfil his own pledge several years after.